There are lots of reasons to love the Mercedes R129-generation SL, not the least of which are its inline-six and V8 power, rear-wheel drive layout, and delightfully 1990s looks. But if those aren’t enough, this 1,180-mile 1992 Mercedes 500 SL “barn find” for sale on insurance auction site Copart may just win you over with its sheer perfection. This is an insurance company supplied vehicle that is a recovered theft. According to the insurance company claim, the vehicle was stolen from the dealership in November 1991. The vehicle was recovered in late 2018 and was found that the vehicle had been stored indoors the entire time and only was driven 1,186 miles. And it’s teal, because 1990s car. Check out the auction here. If you find yourself on the fence, debating whether or not to get in on the bidding fun, this MotorWeek video will almost certainly put you over the edge. Just look at that Stuttgart-designed luxury convertible rip those smoky burnouts, and imagine how badly this one for sale on Copart has been yearning to do the same. 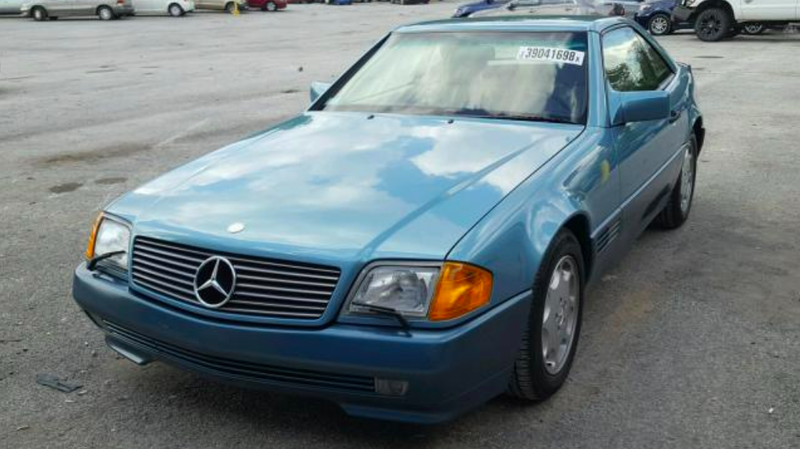 For $4,900, Would This Rare 1991 Mercedes 300SL Let You Stick It To The Man?